FOB – Free On Board (named loading port): The classic maritime trade term, seller must load the goods on board the ship nominated by the buyer, cost and risk being divided at ship's rail. The seller must clear the goods for export. 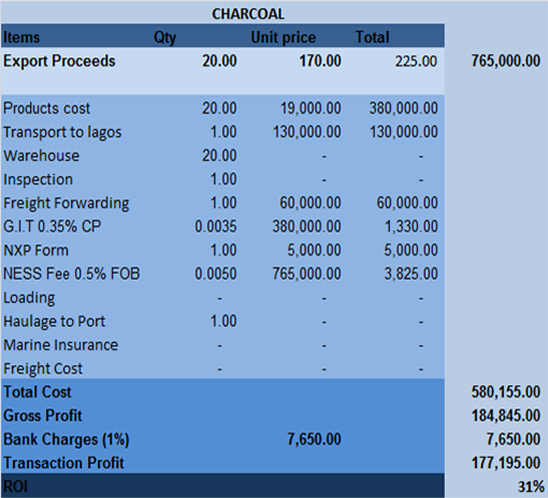 CIF – Cost, Insurance and Freight (named destination port): exactly the same as CFR except that the seller must in addition procure and pay for insurance for the buyer. 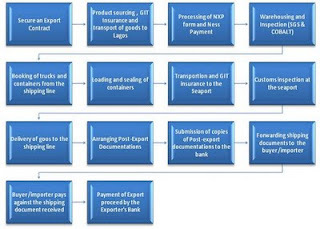 NXP form duly endorsed and stamped by the Nigeria Custom’s Service, evidencing shipment of goods. 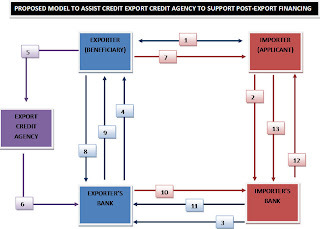 To secure an export contract for your products, the following options can be explored. Internet e.g. www.alibaba.com, www.tradekey.com, www.ecplaza.net, www.tradeboss.com etc. To obtain an export license, you need to register a limited liability company with the Corporate affairs commission (CAC) through your lawyer. Then the following documents will be submitted to the Nigerian export promotion council. 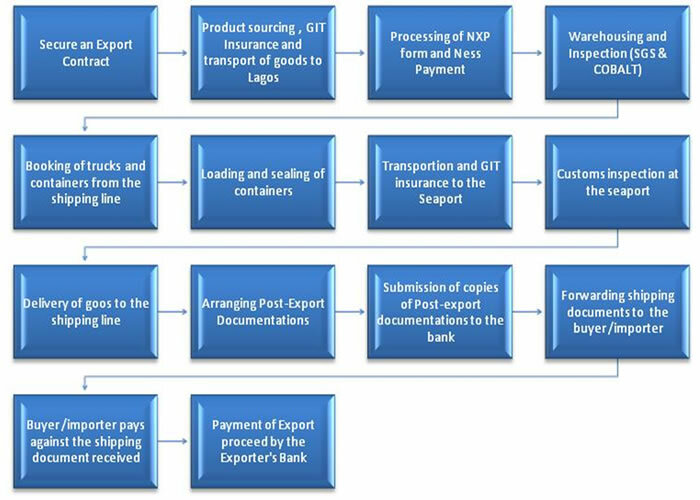 A duly completed export license application form obtained from the Nigerian Export Promotion Council. Availability of products- where to get the commodity? Availability of Market- where do I sell the commodity? Capital- how much do I have? Profitability- how much profit can I make from what I have? Sustainability- for how long can I get this commodity? Nigeria is a country naturally blessed and endowed with items that are in serious demand in the export markets around the world. We are not only blessed with solid minerals (besides crude oil) we are also blessed with good climate and weather conditions to support the growth of commodities that are industrially useful in the developed nations. No wonder an Asian will come into this country with a briefcase and 2-5 yrs down the line, he would have become an employer of labour by harnessing our resources to build wealth for himself via export business opportunities in Nigeria. The postings in this Blog are aimed at awakening Nigerian businessmen, Fund managers and professionals to consider the possibilities of exporting commodities while they are still very active on their present Job. This business is not only very profitable (about 25-100% ROI), it also has a short transaction cycle of about 6-8weeks. It is a very good plan B, and it could therefore constitute very good option in your exit strategy as an employee. 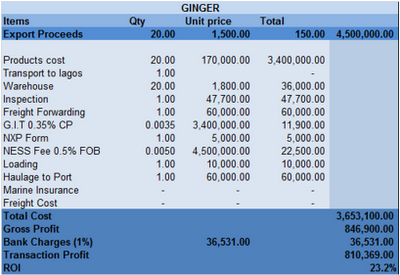 This blog is dedicated to assist you and answer all your questions about exporting commodities in Nigeria with minimal involvement, very low overhead cost and also ensuring the security of your capital. To learn more, click on the different topics in the Export Information Archives on the side bar.